Rose Macaulay’s Non-Combatants and Others, published in 1916, offers a striking demonstration of the changes which war had brought – not only in its setting (the novel is based in events in 1915), or in its stance (it is often seen as the first anti-war novel of WW1), but also in its language. If war is, as on p.14, described as ‘unspeakable’, it is the range and diversity of its speakabilities which can instead leap from Macaulay’s pages. If core words remain the same, the narrative — from its opening chapter – sets out a langscape of sense and allusion which would have left pre-war readers firmly in the dark. What, after all, is to do one’s bit (p.9)? And why is knitting, and the knitting of body-belts (ibid; and p.82) suddenly so important?. ** What are ambulance cars, and why is a woman driving one in France? Non-Combatants could, in such ways, often deliberately remind its readers of the sudden foreignness of the present. Ambulance car is a term common in 1914-18, though one which the OED had not – and still has not – included. Betty –who drives it – sends letters home which are marked ‘on Active Service’ – here in uses which, if again common in WW1, sit uncomfortably even with the modern OED definition of this term (‘direct participation in military operations as a member of the armed forces’). That such letters can be described, metaphorically, in Chapter 1 as ‘bits of shrapnel, crashing’ into the world at home testifies to other patterns of change. 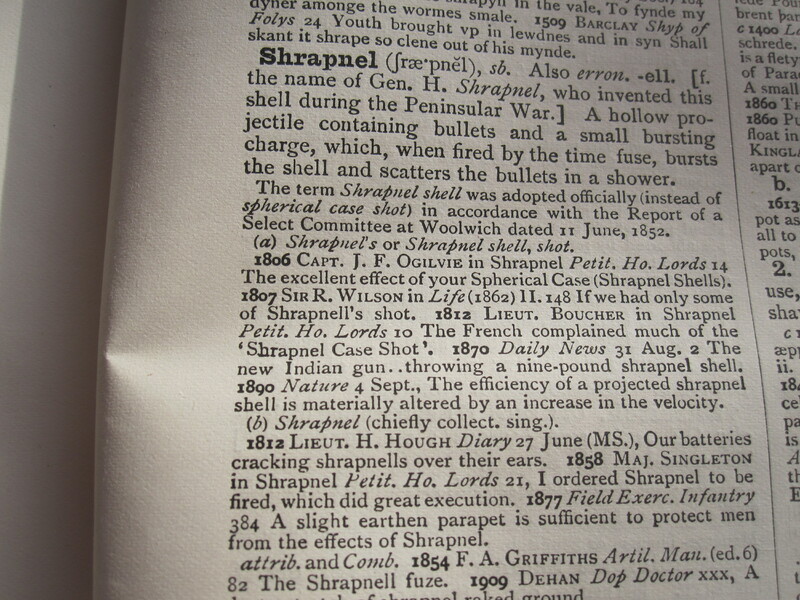 As other posts on this site have explored, shrapnel was an early marker of change in Words in War-Time, hovering – for the duration, as well as afterwards – between its traditional meaning, here as defined by the OED March 1914 (‘A hollow projectile containing bullets and a small bursting charge, which when fired by the time fuse, bursts the shell and scatters the bullets in a shower’), and its newer familiarised sense which Macaulay makes use of here: ‘fragments of a bomb, shell, or other object thrown out by an explosion’. Shrapnel as a more literal referent appears too, used in an account of war trauma, located in a hospital at home. Nervy (often used as an early euphemism for shell shock) serves in the same passage to draw language and time closely together. ‘I hate not having a bath after hospital. But one can’t grudge it to the dear lamb. How do you think he looks, Alix? Rather nervy, he is still. That’s the worst of a head wound. You know Mahoney, Margot, that Munster Fusiliers man with a bit of shrapnel in his forehead? The other men in ward 5 say he still keeps jumping out of bed in his sleep and standing to. The only way they can get him back is to say ‘Jack Johnson overhead,’ and then he scuttles into bed and puts his head under the pillow; only sometimes he scuttles under the bed instead, and then the only way they can get him out is to say ‘Minnie’s coming,’ and he nips out quick for fear of being buried alive. 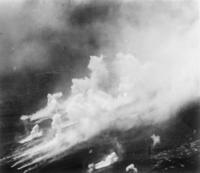 From the beginning of the war, fire – as ‘flame’ rather than with reference to the various projectiles which might be used — had, however, also been used as weapon per se. A propensity to use flame was, for example, often depicted as a further manifestation of German barbarity, underpinning the characterisation of the enemy as firebugs in the sense ‘an incendiary’ or someone who was, by definition, inclined to use arson. Arch-firebug (in a particularly Germanic compound) was similar, while carbonize, as other posts on this site have explored, likewise comes into marked prominence in early news reporting (and atrocity propaganda). Quantities of “fire lighters” – so indispensable to a German army on the march – are stored with tins of benzine one of the military depots on the outskirts of the city. It would be an easy matter for a brigade of these well-trained incendiaries to set Brussels ablaze from end to end in an hour. Following came the bearers of heavy tubes of petrol fitted with sprays, with which they drenched the woodwork and furniture of each room thus exposed, then the firelighters with their long torches, smeared with a substance which makes them glow like live coals and emit an intense heat without flame. Dated to September 1914, the firing of Belgian cities such as Louvain is thereby depicted as a two-stage process. Fire-lighters (sense 1) are devices which spray petrol which are used to prepare the ground. Then come the fire-lighters (sense 2) — the ‘well-trained incendiaries’ who, bearing ‘long torches’, ignite the fuel. Souvenirs and relics: language, memory, and memorialisation in 1914-15. A souvenir, in the relevant fascicle of the Oxford English Dictionary, first published in January 1914, was defined as a ‘token of remembrance’ – one which usually, as it specified, took the form of ‘a small article of some value bestowed as a gift’ and, as such, constituted something ‘which reminds one of some person, place, or event’. Souvenir spoons are recorded in a citation from 1893, and souvenir cards in a citation from the Daily News in 1900. Notions of value were, however, in reality, able to be constructed in emotional as well as (or, indeed, often instead of) monetary terms, being based in the perceived significance of the event or occasion, or the circumstances with which the object in question was associated. Above all, the souvenir was defined by its role in commemoration, whether in private or public forms. It was a keepsake, the Dictionary explained – something kept for the sake of remembrance. That war was, from the beginning, also made part of similar processes of commemoration and active recall is also clear. Some of this was, of course, deeply ironic, in ways which already took meaning and use in newly distinctive directions. Souvenir, a word identified as unassimilated and ‘alien’ in the OED (being prefaced by the distinctive ‘tram-lines’ or || by which non-naturalised forms were marked out), would, for instance, quickly acquire a set of subversive associations. ‘All shells are called “souvenirs”’, as a ‘Letter from the Front’, reprinted in The Star in November 1914, explained. 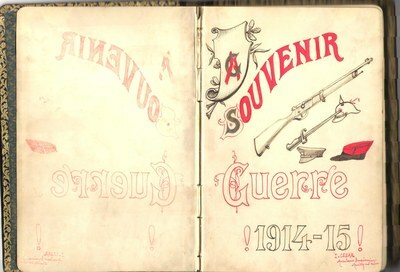 Souvenirs of this kind came to embody an ironic form of gift-giving in which the enemy proved extraordinarily generous. That the Allies were, in turn, rendered wholly mindful of the Germans by such means was plain; as in the previous post, the image of Tommy, sheltering in his trench while shells of various kinds whizz overhead, is highly evocative. Gifts of this kind were best accepted from a distance – as well as reciprocated in kind. Were Tommy to be unlucky, such acts of remembrance were moreover inscribed in all too visceral ways. An article headed ‘Argument over a Bullet’, detailed in the Scotsman in March 1915, records in considerable detail the argument which ensued between two hospitalised soldiers over the same bullet – the “souvenir” in question — which had, in fact, passed through both of them. 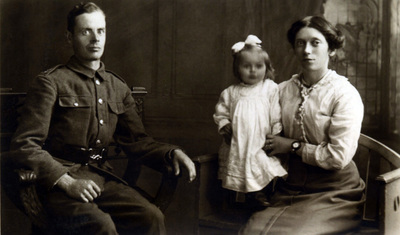 A British soldier’s family of three. The Army Children Archive, Copyright: Creative Commons. Baby can be a surprisingly prominent form in the discourse of early WWI. As earlier posts on this site have explored, it can, compounded with –killer and -killing, be made to act as a resonant image of German ‘frightfulness’ and its deployment against the innocent and vulnerable. ‘Scarborough’s Scorn for baby-killers’, as a headline in the Daily Express announced on December 22nd 1914; ‘The mere discussion in this country of the desirability of making air raid reprisals on German towns has been sufficient to inspire numerous earnest appeals to the Kaiser to put an end to the baby-killing activities of the Zeppelins’, the Express added in a similar mode in October 1915. Elsewhere in the Words in War-Time archive, baby can be used in depicting the surrogate family bonds of trench and army life. ‘It is odd that the N.E.D. [i.e. Oxford English Dictionary] has no heading or quotation for ‘baby’ in the sense of youngest member of a regiment’, a note in the archive states, providing plentiful evidence for contemporary usage in this respect. The different types of our own ordnance also all have their designations. A certain heavy howitzer whose dull boom is easily distinguishable above the reports of any other piece is affectionately termed “Mother,” while another is, somewhat inappropriately called “Baby”. (Evening News,January 1915). Traversing, sure as fate, and never a dud”. Siegfried Sassoon’s poem ‘Counter-Attack’ (first drafted in the summer of 1916) reveals a ready familiarity with the duds one might encounter at the Front. Here, if the ‘five-nines’ in line 2 of the extract above reference the German 5.9 inch artillery shells, their high success rate is emphasised too. In the attack Sassoon describes, duds – shells which fail to explode – are absent. ‘Mute in the clamour of shells he watched them burst’, as the poem continues. It is nevertheless worth remembering that speakers of English from before war would have struggled to comprehend the lines as thus composed. As the first edition of the OED records – here in a section published in 1897 — duds in English referred primarily to clothing or to things. One could wear duds, or possess them. In neither case, however, did they resemble elements of military hardware. ‘Girls knit away small fortunes … on little duds that do nobody any good’, as Harriet Beecher Stowe stated in her novel Little Foxes in 1866. ‘How precious are all the belongings of a first baby; how dear are the cradle, the lace-caps, the first coral, all the little duds which are made with such punctilious care and anxious efforts of nicest needlework’, we are told in Anthony Trollope’s The Three Clerks (1857).